Featured image: The blue and white diamonds (fusils) are a familiar Bavarian symbol, adopted in the late 13th-century by the Wittelsbach family who ruled Bavaria from 1180 to 1918. As a product of the coastal and mountainous Canadian Southwest, I always feel the pull exerted by the Bavarian Alps regardless of where I am in Germany; it’s been this way over the past 18 years. But there’s more to Bavaria than fairytale castles, Oktoberfest, and BMW, although they’re spot on for the Wurst (sausage). And frankly, there’s a ton more to Germany than Bavaria, but that’s one of many reasons for this entire blogsite after all. Located in southeast Germany, Bavaria includes more than a half-dozen World Heritage Sites, the pre-Easter Fasching/Fastnacht festival, the sight of Audis on the Autobahn, over one thousand years of wine-making in Franconia, and violin-making since the late 17th-century, among many things to explore, eat, and experience. The history of Bavaria goes back to at least the Roman Empire in their recognition of the Celtic Boii people settling in border lands north of the Danube river. The word “Bavarian” stems from the Latin “Baiovarii” (people of the Boii). Subsequent centuries saw the development of a duchy, absorption into the Holy Roman Empire, the formation of an independent kingdom, rivalries with Prussia and Austria, becoming a constituent member of the German Empire in the late 19th-century, dissolution in the Nazi Third Reich, post-war reconstruction, a new federal state within West Germany, and now one of 16 federal states within a united Germany. Bavaria is the largest state in size with about 20% of the country’s land area. Bavaria is home to about 13 million people which is about 15% of the country’s total population. 1818 enactment of the Constitution of the Kingdom of Bavaria by Maximilian I Joseph. The parliamentary and constitutional monarchy lasted until November 1918. In November 1918, Bavaria was no longer a kingdom and declared a republic or “state”. The official title today is the Free State of Bavaria. By the end of the 19th-century, Bavaria was one of the first places within a greater German-speaking federation or nation-state where a limited working attempt at democracy* was introduced after centuries of feudal, religious, palatial, and imperial rule. Bavarians will be the first to say they’re an independent lot who’ve always been ahead of their time, even as I struggle mightily with understanding the Bairisch / Boarisch (Bavarian language). To mark the two anniversaries this year, I highlight 18 locations to provide quick looks throughout Bavaria which have nothing to do with fairy-tale castles or Oktoberfest. The locations are distributed throughout Bavaria’s seven “Regierungsbezirke” or administrative regions. Click the arrow-window icon at the upper-left corner of the map below for the legend. Established in 1516 by Jakob Fugger the Younger (“Jakob Fugger the Rich”), the Fuggerei in Augsburg is one of the earliest examples of social housing. The Fuggerei is still in use today as renters pay an annual sum of about €1. Photo: 11 Mar 2017 (HL). 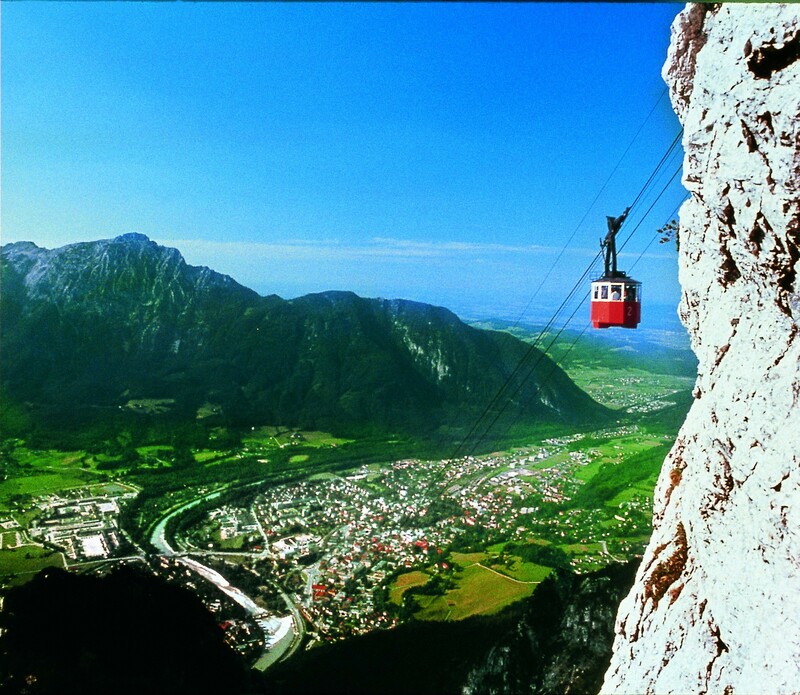 Predigtstuhl cable-car over Bad Reichenall. The earliest settlement dates back to the Bronze Age, and “hall” directly references saline production by pre-Roman Celtic settlers. Photo: Berchtesgadener Land (Lizenzfreie Bilder). Bamberg Rathausinsel (City Hall Island) from Untere Mühlbrücke bridge over the Regnitz river. Since 1993 Bamberg town has been a UNESCO World Heritage Site. Photo: 24 Jun 2010 (HL). Bayreuth’s Margravial Opera House has been inscribed as UNESCO World Heritage Site since 2012. Photo: Guido Radig (Wikimedia, CC BY-SA 3.0). At Hausberg near Garmisch-Partenkirchen is a cozy and familiar sight in southern Bavaria: lounging bovines, grassy meadows, and the frosted Alps. Photo: 9 Oct 2011 (HL). Audi museum mobile in Ingolstadt. Photo: Audi AG (Flickr, CC BY-NC-SA 2.0). Former basilica at lower-left and in foreground the ruins of the temple Forum in the former Roman city of Cambodunum which goes back about 2000 years. Photo: 7 Mar 2017 (HL). The history of violin-making in Mittenwald is described at the Geigenbaumuseum. Shown here at left and right, respectively, the viola and violin were both constructed by renowned violin-maker Mathias Kloz from 1714 to 1715. Photo: 2 Mar 2017 (HL). From Munich’s Peterskirche (Church of St. Peter), the twin rounded towers of the Frauenkirche and the Neues Rathaus (New City Hall) appear at left and right, respectively. At centre in the background is the Olympiaturm (Olympic Tower). Photo: 16 Nov 2015 (HL). Facing west from Sinwell Tower at Nürnberg’s Kaiserburg (Imperial Castle). Photo: Gerhard Gellinger (Pixabay, CC0). A glimpse of the Bavarian lifestyle in winter includes a strong hint of skiing in the Allgäu Alps. Photo: 4 Mar 2017 (HL). Passau’s Old Town glows under the illumination of winter light, as the Inn river flows off in the distance to join the Danube and the snow-covered hills in Austria. Photo: 13 Dec 2012 (HL). In Regensburg, Stadtamhof (shown here) on the north side of the Danube river and the Old Town on the south side have been inscribed as UNESCO World Heritage Site since 2006. Photo: 14 Nov 2015 (HL). From the city wall in Rothenburg ob der Tauber: Gerlachschmiede (Old Forge) at centre and Rödertor (Röder Gate) at right. Number 11 of 20 on a pictorial tour; photo: 12 Nov 2015 (HL). As an astronomer, I attended meetings at the Schloss Ringberg conference facility in the Tegernsee area. This view from nearby Wallberg mountain faces north to Tegernsee lake and the towns of Tegernsee (centre-right) and Rottach-Egern (bottom-centre). Photo: Aisano (Wikimedia, CC BY-SA 4.0). Wallgau’s Hotel Zur Post (mail/post hotel) was first built as guesthouse “Zum alten Wirt” in 1621, and includes Bavarian “Lüftlmalerei” paintings by Franz Karner in 1763. The wall frescoes were popular throughout the region in the late 18th-century. Photo: 1 Mar 2017 (HL). With this view of the South Garden, the Würzburg Residence has been inscribed as UNESCO World Heritage Site since 1981. Photo: 17 Oct 2017 (HL). 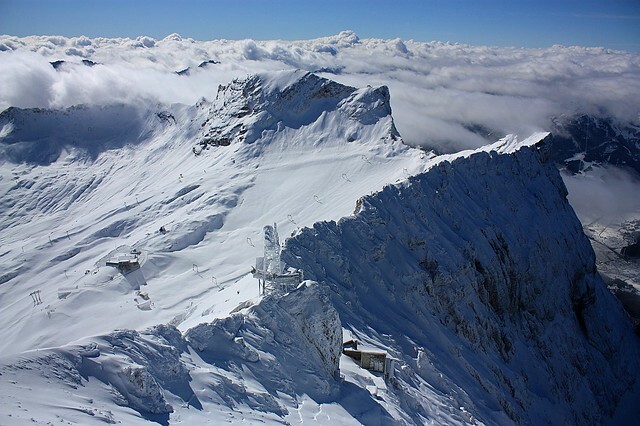 At the highest point in Germany, this view down from the Zugspitze summit faces southwest. At upper-centre is Schneefernerkopf, at left-centre are Sonn Alpin and the Zugspitzplatt plateau, and at right is the Zugspitzeck. Photo: 9 Oct 2011 (HL). Are you going to Germany soon? Will you visit Bavaria as well? Leave a comment or question below. * German writer Thomas Mann wrote in 1923 for the American magazine “The Dial”: “Bayern und München im Besonderen war demokratisch, lange bevor in Deutschland von ‘Demokratie’ in irgendeinem revolutionären Sinne die Rede war. Es war und ist demokratisch im folkhaft-volkstümlichen, das heißt also: in konservativem Geiste.” (My approximate translation: Bavaria and Munich was in particular democratic long before ‘democracy’ was part of any conversation concerning a revolution in Germany. In a conservative sense, Bavarians have always been democratic at a grassroots level.) His quote was also cited in “Bayern in Zitaten der Welt”, by Brigitta Roth, München 2001, pg. 178. Thomas Mann would go on to win the 1929 Nobel Prize in Literature. The modern constitution for the Free State of Bavaria is available to view online at the State Chancellery website (in German). Other than the Creative Commons (CC) images, I made the photos labelled “(HL)” on multiple visits to Bavaria in 2010, 2011, 2012, 2015, and 2017. This post appears on Fotoeins Fotografie at fotoeins.com as http://wp.me/p1BIdT-9gv. All great locations!!! So excited to learn about these anniversaries! Hi, Lorelei. I’m glad to hear you’re tempted by some/many/all of these locations. With the time you’ve spent living in and writing about Germany, I’m sure you’ll find something great about your future visits. 😊 Thanks for stopping by and for your comment! Henry, thank you so much for honoring my home country, I mean Bavaria. You seem to know more than I do, although being born there and have been living there for the bigger part of my live. In a way I enjoy getting home sick through your wonderful posts, living though them. Hi, Cornelia. Heimat can be a wonderful thing, and there are some extraordinarily beautiful parts to your Heimatsland. I’m sure you already know this, but I like how the word “Bohemia” is a joining of words “Boii” and “Heimat” 😊 I still have to figure out what the suffix “-varii” means to have formed “Boivarii” and eventually “Bavaria”. Thank you again for visiting (my blogsite) and for your kind comment! Oh wow, what an interesting comment of how to figure out the words of Bavaria, you are way ahead of me as a Bavarian. You made me thinking about this. Thank you for your meaningful comment, Henry.